Being the market leader when it comes to global automotive sales surely hasn’t affected Toyota Motors’ determination to expand their share each year. With the recently revealed Philippine sales figures putting them at the top spot yet again, proving that its much more than mere luck that has led the Japanese automakers to this state of global dominance. But that’s certainly not stopping their factories from churning out more eye catching vehicles in the future, which clearly doesn’t sound like a bad news for the Toyota fans across the globe. Already wielding 39.92% in the Philippine automotive sales last year, let us take a look at some of the most popular Toyota models responsible for their heavy sales. The vehicle that won the Philippine war for Toyota Motors, the Vios is the highest selling car in the country and has been able to cater the filipino craze for sedans. Despite of being in the most cut-throat vehicle class in the country, the Vios has come out on the top like a true champion. The vehicle is currently offered with a 1.3-litre mill and a 1.5-litre engine, with an extremely high demand for the former. The latest Vios has already been launched in China and might also make its Philippine appearance owing to its excellent market. The Fortuner has been one of the flagship SUV models by the manufacturer and enjoys a fair demand in most regions. The 2016 model has literally obliterated most rivals in its class with only the Montero Sport giving it some competition. The new model looks evidently buffed-up as it underpins the platform of a pickup truck. The vehicle is offered with a choice of 3 engines that include a 2.4-litre, a 2.7-litre and a 2.8-litre mill. The 2.4-litre models are available with both automatic and manual transmissions but the rest of the engines are offered with only an automatic gearbox. Toyota’s iconic MPV model the Innova is one of the most popular models by the manufacturers. It stands as the highest selling vehicle in the neighbouring Indonesian market and is quite popular among larger families. The 2016 Innova is offered with both gasoline and diesel drivetrains, of which the diesel model enjoys the most sales. The new model not only pushes the older models technology further but also features an attractive design that sets it apart from its competitors. Big or small, never underestimate the potential of a Toyota branded vehicle. Although some might disagree with this, it certainly stands true for the Toyota Wigo. The new Wigo might be the smallest car in Toyota’s fleet, but is certainly a formidable entry in its class. Being a compact hatchback, the Wigo presents a highly stylish city car design with a high emphasis on driving comfort and fuel economy in heavy traffic. It is offered with a single choice of engine, which is a 1.0-litre VVT-i engine that is known for providing an astonishing fuel economy. The added automatic transmission offered on the highest variant, further enhances the driving comfort making it a perfect choice for small families. 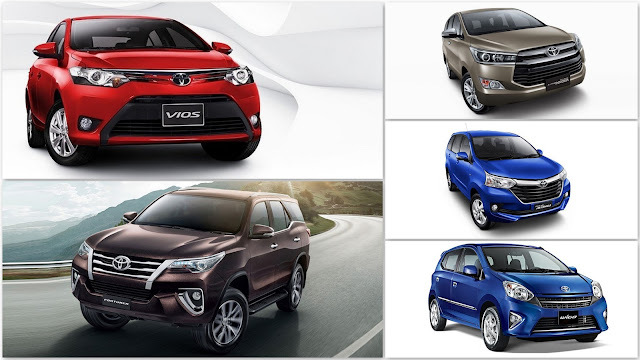 Toyota Avanza has been leading the MPV segment since its launch in the country last year. The all-new Avanza reflects the commitment of the brand of constantly striving for more by improving and bringing change to its products. This Toyota drive has become the leading name in the market as it offers the best in modern comforts along with robust body and the latest in automotive technology. Powering this MPV is a new Dual VVT-i 1.3-litre engine that puts out 95 hp and 121 Nm of peak torque. With the adaptable and luxurious cabin equipped with all the modern amenities and entertainment, the new Avanza is everything you asked for. These aforementioned models are not just a hit in the Philippines, but models such as the Fortuner and Innova have also caused a lot of rival outrage in other countries. With more updates to be announced this year, we will certainly see these Japanese auto experts rule the global automotive sales with an iron hand. Toyota has built such a reputation of trust and reliability for itself that it's way more likely to be able to secure market share in the newer markets before the more exotic options come in. I don't think they'll have much of an issue remaining an industry leader for the next years at least!